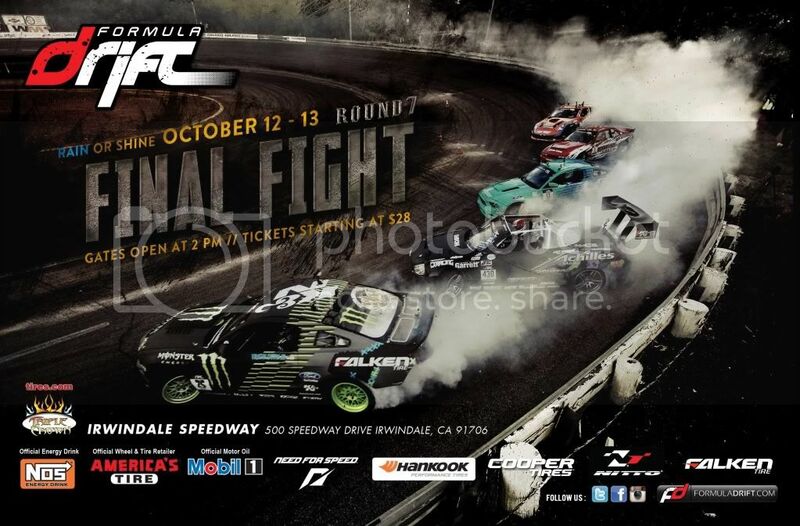 Hybridz, Friends & Guests:Team Hybrid will not only be present @ Formula D Irwindale - 10/12-13/12, Round 7 "Title Fight" but will have Hybrid Cars in "many" company booths. Lastly, Hybridz, Hunnyz and some of our special VIP friends/guests will have a special invite to experience FD in the NOS Energy Rooftop VIP Stands and party the night away with us. The Irwindale Speedway is known as the "House of Drift." The legendary drifting venue gave drifting in the U.S it's roots and is often referred to as the "birthplace" of American drifting.The Formula DRIFT Championship will be decided at this final event of the season and drivers will battle one last time to earn the coveted title of Formula DRIFT champion. The track is the home track for most of the drivers and each year the competition grows more intense. The infamous course is challenging and exciting utilizing part of the short oval track and many inside turns. Daijiro Yoshihara took home the championship and Tires.com Triple Crown bonus award while Tyler McQuarrie finished in 1st place during the event. Come watch as the drivers go all out and put it all on the line one last time for a chance to become the new Formula DRIFT champion. Great news and surprise update today. Allan Mortel S2K in AEM Booth. James Lin E36 in K&N Booth. Kevin S2k in ClutchMaster Booth. Daniel Spielman in NOS Energy Booth. Reggy EVO X in NOS Energy Booth. David Chen Porsche 996 in NOS Energy Booth. Fidel Garcia S60R in NOS Energy Booth. Larry Hyunh 350Z in AEM Booth.